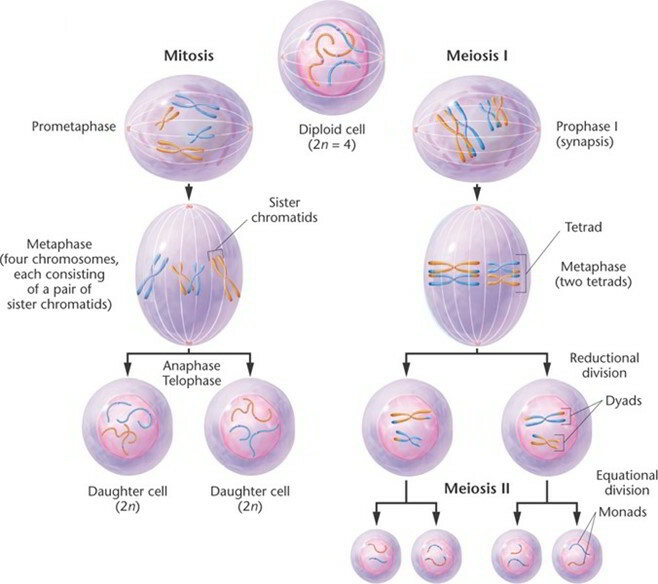 Cells divide by two mechanisms called mitosis and meiosis. Meiosis, however, is restricted to one purpose, the production of eggs and sperm, and is therefore not discussed here thoroughly. Mitosis serves all the other functions of cell division: development of an individual, composed of some 40 trillion cells, from a one-celled fertilized egg; growth of all tissues and organs after birth; replacement of cells that die; and repair of damaged tissues. Four phases of mitosis are recognizable: prophase, metaphase, anaphase, and telophase. At the outset of mitosis, the chromosomes shorten and thicken, eventually coiling into compact rods that are easier to distribute to daughter cells than the long, delicate chromatin of interphase. There are 46 chromosomes, two chromatids per chromosome, and one molecule of DNA in each chromatid. The nuclear envelope disintegrates during prophase and releases the chromosomes into the cytosol. The centrioles begin to sprout elongated microtubules called spindle fibers, which push the centrioles apart as they grow. Eventually, a pair of centrioles comes to lie at each pole of the cell. Some spindle fibers grow toward the chromosomes and become attached to the kinetochore on each side of the centromere. The spindle fibers then tug the chromosomes back and forth until they line up along the midline of the cell. The chromosomes are aligned on the cell equator, oscillating slightly and awaiting a signal that stimulates each of them to split in two at the centromere. The spindle fibers now form a lemon shaped array called the mitotic spindle. Long microtubules reach out from each centriole to the chromosomes, and shorter microtubules form a star like aster,6 7 8 9 which anchors the assembly to the inside of the plasma membrane at each end of the cell. This phase begins with activation of an enzyme that cleaves the two sister chromatids from each other at the centromere. Each chromatid is now regarded as a separate, single-stranded daughter chromosome. One daughter chromosome migrates to each pole of the cell, with its centromere leading the way and the arms trailing behind. Migration is achieved by means of motor proteins in the kinetochore crawling along the spindle fiber as the fiber itself is “chewed up” and disassembled at the chromosomal end. Since sister chromatids are genetically identical, and since each daughter cell receives one chromatid from each chromosome, the daughter cells of mitosis are genetically identical. The chromatids cluster on each side of the cell. The rough ER produces a new nuclear envelope around each cluster, and the chromatids begin to uncoil and return to the thinly dispersed chromatin form. The mitotic spindle breaks up and vanishes. Each new nucleus forms nucleoli, indicating it has already begun making RNA and preparing for protein synthesis. Telophase is the end of the nuclear division but overlaps with cytokinesis, the division of the cytoplasm into two cells. Early traces of cytokinesis are visible even at anaphase. It is achieved by the motor protein myosin pulling on microfilaments of actin in the terminal web of the cytoskeleton. This creates a crease called the cleavage furrow around the equator of the cell, and the cell eventually pinches in two. Interphase has now begun for these new cells.